Now that Android 6.0 has started rolling out to Nexus models, it is time for Google to take care of the Android One handsets. These are entry-level phones priced accordingly, and with just enough features as to create value for emerging market consumers. The hardware is built by smartphone manufacturers using designs and standards provided by Google. Marketing of the devices is also Google's job, and the company hopes that once someone purchases an Android One handset, they decide to stick with the platform for the rest of their life. Because Android One phones are loaded with stock Android like the Nexus devices are, they are near the front of the line when it comes time to receiving Android OS updates, which come straight from Google. The Android 6.0 update includes contextual search with Now on Tap, and improved battery life thanks to Doze and App Standby. The former allows a phone that is unplugged and idle to save battery life, by not connecting to the network. Consider it to be an automatic Airplane Mode that turns on when you don't use your phone. With App Standby, apps on an unplugged handset will go to sleep if they are not used. That means no background updates, and scheduled jobs are shut down. Android 6.0 also adds native support for fingerprint scanning. Apps will request permission to use certain features, or parts of your phone, just before that specific feature or part is actually used. With Android 6.0, no longer will users have to give permission in bulk while installing an app. Marshmallow also supports faster data transfers and battery charging through the new Type-C USB port, and multitasking speed is improved as well. 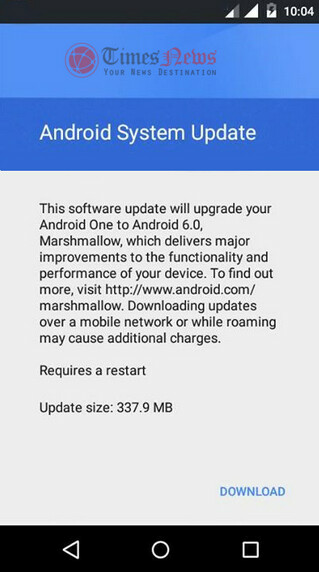 The size of the update sent to a Spice Dream Uno Android One handset was 337.9MB, so you should be connected to a Wi-Fi network when downloading and installing it. You should also have your battery charged to at least 50%. And since the update to Android 6.0 is being sent OTA, it is disseminated in waves. This means that it might take a few days before it arrives. You can try to manually download the update by going to Settings > About phone > Software updates. good for a 4500 RS phone.